Norka-Roots is the field agency of the Department of NORKA, set up in 2002. It acths as an interface between the Non-Resident Keralites and the Government of Kerala and a forum for addressing the NRKs’ problems, safeguarding their rights and rehabilitating the returnees. 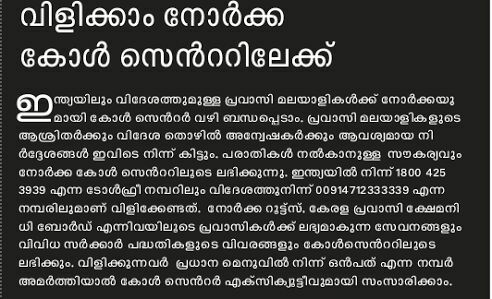 · Cultural exchange programme between the natives and Malayalees settled abroad. · A relief fund for rendering immediate assistance to NRK’s in need. · Resettlement and reintegration of NRKs returning to Kerala. · To facilitate the creation of a high calibre human resource pool.